I got inspired when I came across Midori style note book used by travellers. Here is my version which my children can use with "flash cards" to study. Those who like to cook should find it useful too as you can use the "flash cards" to list ingredients you need to cook a dish so that you can take it out to go shopping for them. Of course, you can use it like a regular Midori while traveling. 1) Cut strips of about 5.5cm in height out of each page. That should give you 3 strips per page. 2) Fold the paper so that the edge touches the line at the side of the paper. 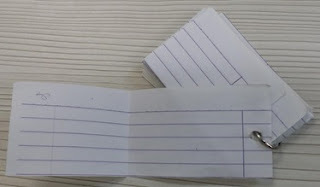 3) Gather folded paper and punch a hole to insert a file fastener to hold them together. 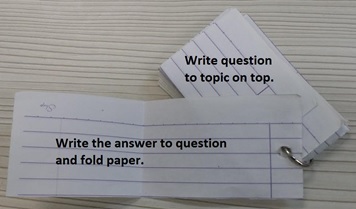 On each strip of flash card, write the question to a topic you are studying on the folded top. Open up it up to write the answer. 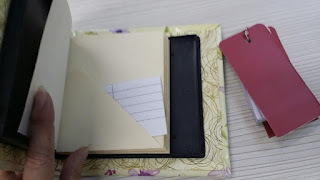 Now you can create a Midori style notebook with pockets so that you can slip the flash card in it. This is how my Midori note book looks like with the flash card. You can read how this is made at the following link "Midori Style Note Book with Pockets". Following are other ways you can make use of this note book. - Write recipes on the blank pages and slip the list of ingredients required into pockets created. Y9ou can then take list out when you need to go shopping for the ingredients. - Use it as a travel/souvenir collection book. Insert boarding passes, tickets of shows or events you have attended into the pockets. Write your thoughts on the blank pages. - Save cut out of images that inspire in the pockets. Note what it has inspired you to create on the blank pages. - You can also use as a journal and if you are wondering how you can start, read this book, ""How to Be Happy (Or at Least Less Sad): A Creative Workbook" by Lee Crutchley. I think this is a great way to make use of old exercise books or scraps of wrapping paper and cardboard you have on hand. You can read more about study hacks, about book binding or find stuff you need in this project at Amazon.